On factory floors, numerous parts and components move along assembly lines, passing through the hands of numerous operators before being assembled into finished products for customer use. The tracking of components and management of component data is crucially important to the entire assembly and production process. For manufacturers around the world, digital information-based production and manufacturing has become an unstoppable trend. As China’s primary industry, manufacturing has experienced consistent growth and development. However, with a waning demographic dividend and increasing labor costs, the development of traditional manufacturing (which relies heavily on human resources) has slowed over time. The advent of the Internet brought significant change to manufacturing operations, with industrial computers serving as a crucial interface for employees to access the Internet. For factories, the key to optimizing operations is precise management and component allocation from the back-end system, as well as real-time control of assembly and production data. Amid the wave of Industry 4.0, ongoing developments in IoT technology have enabled countless automation applications in manufacturing. A well-known washing machine supplier implemented Advantech’s AIM-65 industrial tablets on their machine production line to enable real-time monitoring and prompt error identification and correction via the Internet. Established in 1984, the client company is a globally renowned washing machine supplier and large household appliances brand. The company’s total sales of large household appliances accounted for 10.3% of the global market in 2016. Additionally, since 2009, the company has been recognized as a leading international brand for 8 consecutive years. During that time, the company’s sales of refrigerators, washing machines, and wine coolers far exceeded that of rival brands, reinforcing their place as the leading household appliances brand. The company has 10 R&D centers, 21 industrial parks, 66 trading companies, 143,330 sales outlets, and clients spread throughout 100 countries and territories. The focus of their collaboration with Advantech was to improve the tumbling-box washing machine production lines. 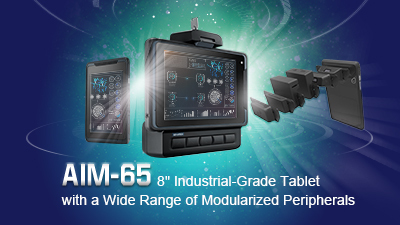 As parts and components enter the assembly line, Advantech’s AIM-65 industrial-grade tablets are used to scan product serial numbers to capture data of components as they pass through every station. This data is recorded and transmitted to the back-end database for storage. Pictures of the assembled components are also taken to enable error correction if necessary. 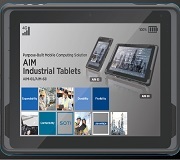 Throughout the entire assembly and data collection process, Advantech’s AIM-65 industrial tablets are connected to the factory network for real-time data transmissions. One of the client’s initial requirements was that the device for collecting component data be compact and lightweight to ensure portability. AIM-65’s lightweight (600g) yet rugged, fanless design offers maximum portability and configuration flexibility, while the IP65 rating for protection from water and dust ingress ensures the system can withstand operation in harsh factory environments. Equipped with an 8” WUXGA IPS LCD display and front and rear cameras, AIM-65 supports the industrial Android operating system for ease of development and high compatibility with other platforms, facilitating integration with the company’s existing software and systems. For superior convenience, Advantech’s AIM-65 tablet combines the various functions of data collection, imaging, real-time communication, and data transmissions into a single device. Real-time data transmissions allow managers to monitor all production and assembly processes remotely in order to control error rates and promptly resolve any issues. AIM-65 serves as a hub that connects all components with back-end systems, minimizing time wastage and improving operational efficiency. In January 2016, the client company, a leading German automobile manufacturer, opened a new engine factory in Shenyang, China. For the client, this factory was not only its first engine factory located outside Europe, but also the only one of its factories to include casting, machining, assembly, and battery-related operations. Moreover, the factory harnesses all of the company’s advanced engine production technology, and the equipment and standards used for the final assembly line are the same as those implemented at its European factories. At the company’s engine factory in Germany, assembly line workers use Advantech’s PWS-870 tablets, which are renowned for their reliability and high performance. Therefore, PWS-870 tablets were the company’s first choice of device for their newly established factory. On the factory floor, a machining accuracy of at least 6 microns (equal to one-quarter of the width of a single human hair) is required. This is because precision machining and assembly invariably involves numerous tiny components. Because of the components’ small size and delicate properties, only handcarts are used for material transportation. PWS-870 tablets connected to the factory intranet and integrated with barcode scanners via their USB ports are used to receive material retrieval orders sent from the back-end control center. By following the order instructions, workers are able to easily retrieve materials and distribute components to the appropriate location for assembly. Equipped with advanced communication technologies and custom ERP software, PWS-870 enables efficient, optimized production by facilitating real-time monitoring, material retrieval management, component distribution, and effective resource allocation. On the factory floor, every stage of the assembly process includes a quality control station for ensuring consistent quality. Every casted component has a QR code that must be scanned using the PWS-870 tablet before it moves onto the next stage of assembly. In this way, a clear production record is created for every engine to enable product tracing at any stage of production or assembly. Should an error occur, the workstation responsible can be identified via the QR code. Furthermore, the use of PWS-870 tablets to scan product QR codes and transmit the collected data to the back-end database in real time enables managers to monitor all operations and ensure that relevant standards and regulations are met. A well-known American automobile manufacturer is one of the leading enterprises of China’s motor industry. The company was responsible for building China’s first internationally accredited flexible production line, which covers all processes for producing finished vehicles, including stamping, vehicle body assembly, painting, and final assembly. The production line also includes powertrain manufacturing processes, including engine and transmission assembly, and supports mixed model production. Additionally, the five principles of “standardization, production quality, continuous improvement, shortened production cycle, and employee participation” have been incorporated into all production processes. 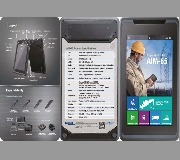 Advantech’s XMT5/10 is a 7-inch industrial-grade, RISC-based, vehicle-mounted tablet installed with custom material pulling software and connected to an external barcode scanner. XMT5/10 is also IP65 rated for protection from dust and water ingress and features a patented internal voltage module that ensures stable performance. Moreover, XMT5/10 is equipped with diverse wireless communication technologies that support rapid signal switching with low packet loss rates. These three advantages differentiate XMT5/10 from other similar products and ensure that the solution will satisfy the company’s operational requirements. 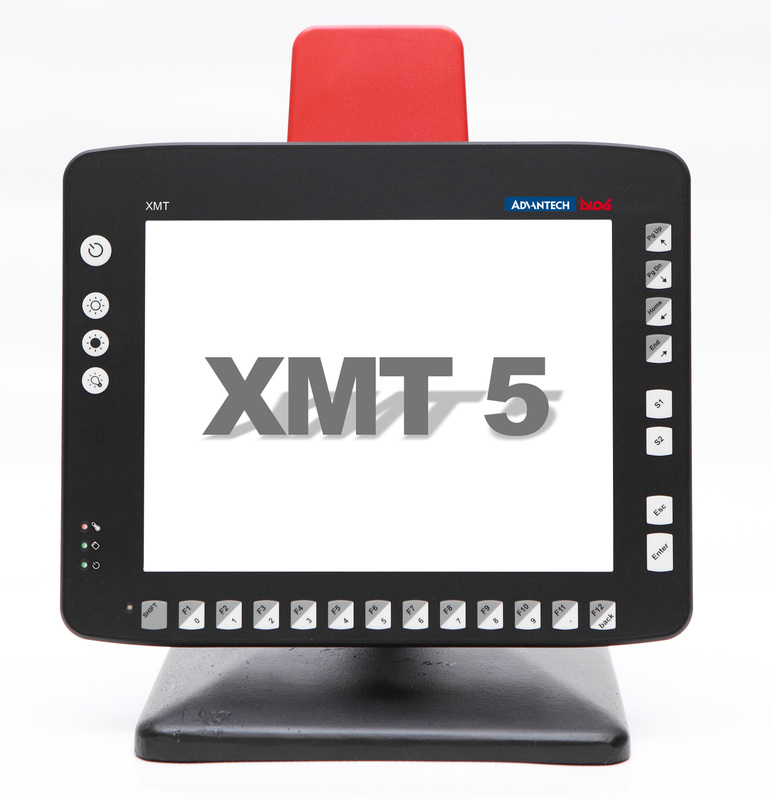 For production line applications, the XMT5/10 tablet is used to receive material retrieval instructions sent from the back-end control center via the company’s intranet. During product assembly, a mechanism with a hook is used to fetch materials. This hook can be easily integrated with the industrial tablet mounted on forklifts. However, considering the challenges of using this hook mechanism, Advantech designed a protective case for the XMT5/10 tablet to prevent scratches and ensure reliable functionality.